Beard re-signed with the Sparks on Monday, the Associated Press reports. As anticipated, the former Duke standout will be back in the WNBA for a 14th season, including her eighth straight campaign with Los Angeles. 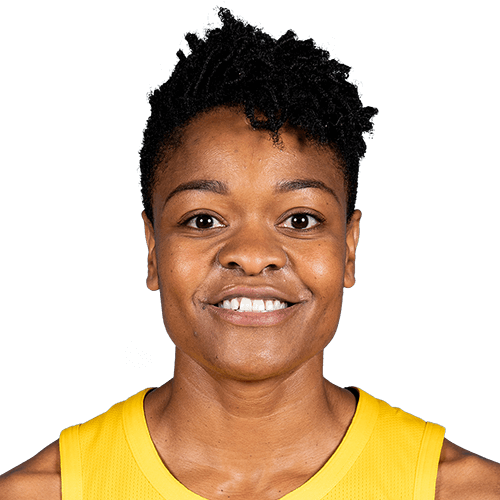 The four-time All-Star averaged a career-worst 4.0 points in 25.5 minutes per game across 30 appearances with the Sparks in 2018 but added to her legacy as one of the best perimeter defenders in WNBA history by earning a spot on the league's all-defensive time for the ninth time. Beard had eight points (3-5 FG, 2-2 FT), two rebounds, two steals and one assist during the 96-64 playoff loss at Washington on Thursday. Beard's eight points Thursday were the most she has scored in a game since posting 11 points back on July 10. With the loss, the former Duke standout's season officially ends, and she averaged 4.0 points and 3.3 rebounds across 30 appearances in the regular season. Beard dropped two points (1-4 FG), four rebounds, two assists and one steal in the Sparks' playoff win against Minnesota on Tuesday. Like she has been all season long, Beard was a non-factor in the playoff win Tuesday, as she managed just two points over four total field-goal attempts. In her 15th WNBA season, the 36-year-old averaged 4.0 points, 3.3 rebounds and 1.7 assists per game in the regular season. Beard didn't score (0-3 FG) but added three rebounds, two assists and one steal in the 86-78 loss to the Mercury on Sunday. It was the fifth time this season in which Beard has failed to score, as she missed all three of her field-goal attempts but did however contribute with three rebounds and two dimes in the loss Sunday. A once feared scorer in the league, the 36-year-old veteran is averaging just 4.1 points across 27 outings in 2018. Beard (groin) will start during Thursday's tilt against the Lynx. Beard had been sidelined for nearly two weeks prior to the All-Star break, but the extra time off has apparently done her some good. Through 22 appearances, the veteran is averaging 4.4 points, 3.3 rebounds, 1.7 assists and 1.5 steals across 25.4 minutes. Beard (groin) was held out of Tuesday's 81-71 loss to the Dream. Beard pulled her groin nearly two weeks ago, but is still dealing with some lingering discomfort. Instead of risking further damage, the Sparks opted to rest Beard once again in the team's final game prior to the All-Star break. Los Angeles now has more than a week off for break prior to a matchup with the Lynx on Aug. 2, so there's a chance Beard is ultimately able to make a full recovery by that point in time. Beard (groin) is listed as questionable for Tuesday's game against the Dream, Andrew Joe Potter of the Score reports. Beard suffered the groin injury on July 12 and has been out since. With Tuesday being the last game prior to the All-star break, the Sparks may elect to sit her out in an effort to have her back at full strength when the break ends. Beard (groin) is out for Sunday's tilt against the Sky, Andrew Joe Potter of The Score reports. Beard has been out since initially pulling her groin July 12 against Dallas. In looking to replace her 25.4 minutes per game, the Sparks will likely continue leaning on Chelsea Grey, Odyssey Sims and Riquna Williams. Beard (groin) is doubtful for Friday's game against the Fever, Andrew Joe Potter of the Score reports. Beard pulled her groin back on July 12 against the Wings. She seems to be nearing a return, though that return is unlikely to come Friday. Beard suffered a pulled groin during Thursday's game against the Wings and won't return, Christopher Lopez of Southern California News Group reports. Beard suffered the injury just five minutes into the game and finishes without recording a statistic. She'll likely have additional tests after the game to determine the severity of it, which should give us a better indication on whether or not Beard will miss time moving forward. The Sparks play the Aces on Sunday, so tentatively consider Beard questionable for that contest. season high 5 assists @ Phoenix on 6/18 and @Chi. on 8/18… Had a season high 5 steals on 5/13 vs.
the top 30 in career assists. points on 7-of-12 shooting and recorded five assists in May 16 opening night win over Seattle. in September 21 win at Phoenix. off-season in Israel as a member of Elitzur Ramla. 2010 (Washington): Missed the 2010 season due to ankle surgery in the off-season. and 2.67 blocks per game. basketball player to have her jersey retired… Named the 2004 Associated Press (A.P.) and U.S.
Women’s Basketball Journal… Capped her career as Duke’s all-time leading scorer with 2,687 points. necessary resources critical to achieving success on or off court.